Glasnevin Trust has given its website a thorough makeover and improved its online searchable database of more than 1.2million burial records. The Trust cares for five Dublin graveyards – Glasnevin, Dardistown, Goldenbridge, Palmerstown and Newlands Cross – as well as two crematorium and the award-winning Glasnevin Museum. In addition to the kind of details you'd expect about arranging burials at these cemeteries, the website carries the events schedule for Glasnevin and allows access to its huge database. The new-look site is much more attractive than its predecessor and information about the records it holds has been slightly extended. But it's the search facility that has been most extensively updated. There is now an Advanced Search function that allows you to narrow down your search dramatically. If you are searching for an ancestor with a common name such as John Doyle, you can now filter your search to include only those John Doyles in specific age brackets, or marital statuses, or with a certain address. You could even limit results with his occupation. Sounds great, doesn't it? And I'm sure it will be after some teething problems are ironed out. The main problem seems to me to be that the date of death (DOD) filter has to be applied to all searches. You can't just search for your John Doyle, widowed, coach-builder aged 31-60, without narrowing down the DOB search to a set date, plus or minus three years. Since 'my' John Doyle is missing after the 1911 census when he was 38, I would have to make seven searches to cover the 60-odd years he could potentially have lived after that date. Obviously the DOD search filter is valuable if you have a good or rough idea when your ancestor died, but if you have no clue, it would be better to leave it as an optional field rather than a mandatory one. A second criticism is that the Advanced Search facility is not immediately offered. Only when you've done a standard search on the genealogy page does the advanced option present itself. There is a short-cut that you might like to take note of: From the home page, double-click the (blue) Genealogy option in the top horizontal menu. Be sure to double-click. From there you can select the Advanced Search option. This still doesn't offer all the search filters (the next page does), but it presents some useful options such as searching by surname alone – use the wildcard facility for the first name – and you can choose the DOB to be plus or minus one year or three. You can also add an address. Obviously the new site has to settle, and I dare say there's a lot of tinkering going on behind the interface, so some of these issues may be resolved in due course. 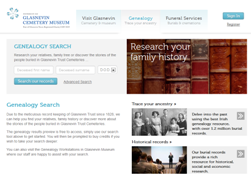 In the meantime, the new site and its search engine, is much improved and we already know that the information provided by Glasnevin's Trust can be wonderfully fulsome. Feedback from users is requested and can be sent via the new site.